January was a low month for me when it came to books being released, my big problem was I was going on holiday and needed to stock up on my books! 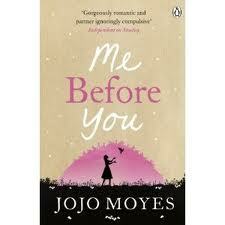 The one that did catch my eye and I had heard good things about was Me Before You, I had never read any of JoJo Moyes previous books but I was eager to try this book to see if it was as good as people had said. I came accross this book in WHSmith in the paperback chart and the first thing I have to say about this book is I love the cover as it gave no indication as to what to expect from the storyline but yet the colours used on the cover instantly pulled me in. From the first chapter of this book I was HOOKED as Moyes has such a realistic and natural flow to her writing, which makes it a believable storyline that just keeps flowing along beautifuly. This is a true romance story through and through and what sets this book aside from other romance books is the unique storyline. The two main characters in this book are Lou and Will and I found that both of these characters are very likeable and they felt very life like that towards the end of the book they feel so familair they are like friends of ours. I loved the different emotions the storyline brought out in me, there were times when I laughed out loud and there were also times when I cried behind my sunglasses!! There really are some heartbreaking moments for both of our characters during this book. It was amazing how Moyes managed to take such a delicate subject matter which could have made for a very depressing read and yet still managed to bring some humour out in the book so that the book didnt feel too deep all the way through the book. In my opinion this is a sensationally moving read that has to be next on your to be read list and easily gets a full 5 stars from me! I've just started reading this, am loving it so far.. The first few chapters got me hooked too :) A few lines in the first few chapters have made me laugh out loud! I have it in my library book pile. Me Before You will grab you and wrench every last tear out of your body. It didn't only make me cry though- there are also some very funny and sweet moments in this book. I really enjoyed the book but the romance reader in me is wishing that I would have never read the end. If you love the sweetness and happiness of romance novels this one might not be for you but if you love the emotional intensity no matter if good or bad grab this one- it is a wonderfully crafted emotional roller-coaster ride.